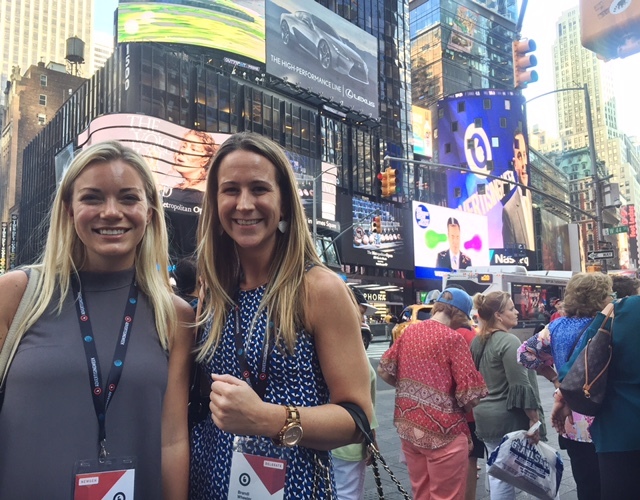 Two members of our San Diego recruiting team have been spending the week in New York City for AdWeek. Brandi Wheeler and Jackie Kellam have been enjoying the networking opportunities, conferences, talks, and meeting with many of our amazing clients. Networking is critical in any industry and events like AdWeek provide not only great opportunities to mingle and meet new people, but the educational aspect is a huge factor when we are deciding when and where to send our people. A multi-day event is always a much better investment as well. Always have plenty of business cards, and make sure they are up to date and high quality. Get as many cards in return as you can, follow up with everyone either via email or on LinkedIn, or both. Dress sharp. Your appearance is critical in face to face meetings and you get one chance to make a first impression. Get to know people. Don’t use your conversation to only try and sell your product or service. Focus instead on building a rapport and relationship. People like doing business with people that they like. Have fun! Networking is a chance to meet people and build relationships, do it as much as you can! We have been working with Aldebaran Associates for several years and their service has always been excellent. Their understanding of the business needs and culture of the organization enables them to provide us with highly qualified candidates. Every member of their team is professional and courteous. We would highly recommend Aldebaran Associates." "Words, again, can't express how awesome your team is. Out of nowhere, you guys came into a very young career and helped to be just the catalyst one needs..."